Season 9 of Doctor Who comes to a close with this six-part story that was written by Robert Sloman and aired from 20 May to 24 June, 1972. With a premonition that The Master (Roger Delgado) is back, the Doctor (Pertwee) warns UNIT, and the Brigadier (Nicolas Courtney) to be on the look out, but when he reveals the source of his premonition, a dream, they are a little more dubious. It is true, however, The Master is back, and working away on an interstitial time device, which he plans to use to summon a being known as Kronos. He us using part of a crystal that came from Atlantis, and is still connected with its larger counterpart in the past. When he activates the device, The Doctor and Jo (Katy Manning) are able to track down his location, but it’s too late, The Master has already trapped Kronos within the crystal, but he doesn’t have enough power to control it, or bend time completely to his will, which is his ultimate goal. Summoning forth an Atlantean from the past, Krasis (Donald Eccles), a high priest of Poseidon, The Master frightens him into service and provides him with information he needs to control Kronos. The two of them craft a way to travel to Atlantis of the past and claim the entire crystal for The Master’s nefarious purpose. Back in Atlantis, the priests and rulers recognize that the omens they are seeing, caused by The Master’s interference in time, portend the imminent destruction of the island. In the present, UNIT is kept at bay by The Master through soldiers, knights and bombs, all pulled out of time, until they reach the sphere of influence of the device, and then they are simply stuck like a fly in amber, at least to the outside viewer. 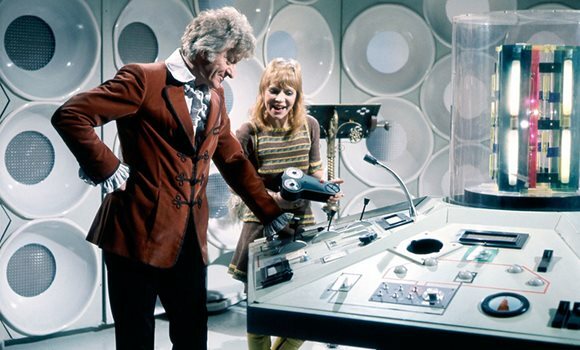 They did, however, bring the TARDIS (for which The Doctor has changed the desktop theme) and he and Jo, materialize their TARDIS inside The Master’s TARDIS, so that they can go with him, and stop his attempt at seizing the crystal, which is guarded by the Minotaur (Darth Vader himself, David Prowse!) and control of Atlantis. 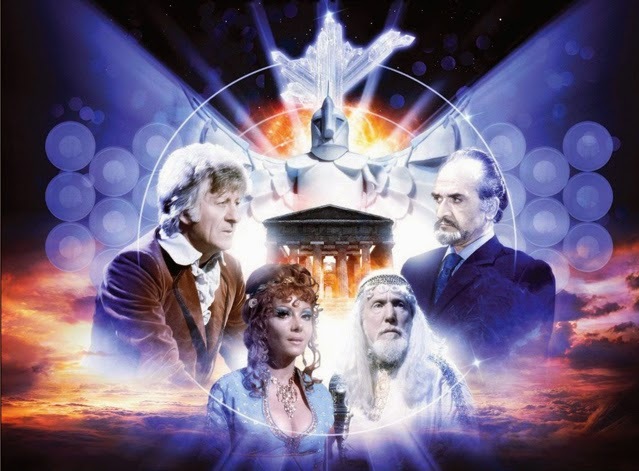 The Master makes a power play for the throne, with the help of Galleia (Ingrid Pitt), while The Doctor, Jo and the former ruler Dalios (George Cormack) are imprisoned, after a frightening encounter with the Minotaur, which allowed them to recover the crystal, now in the possession of The Master. The Time Lord unleashes Kronos, which wreaks destruction on Atlantis. The Master escapes in his TARDIS, with Jo as hostage, and The Doctor in hot pursuit. When it seems destruction for all of them is inevitable, Kronos, now freed once and for all, rescues them, and debates with The Doctor on the fate of The Master, who is remanded to the Time Lord’s custody, but escapes at the last moment, surely to menace our hero again. Nest time we start Season 10! And what better way to start than with a story entitled The Three Doctors?